Menjadi Lebih semakin Populer sejak band ini terus mendapat Kritik tajam sebagai salah satu band yang Meng-Kloning Karakter Sepultura Era " root " dan Soulfly banget ga memudarkan semangat band Thrash Metal dengan beberapa sentuhan Industrial dan Etnis Tribal asal Mezokovácsháza, Hungary yang eksis sejak tahun 1993 oleh Frontman Gitaris dan Vokalis Zoltán "Zoli" Farkas yang memiliki Imej Karakter Max Cavalera banget, toh Ektomorf masih dibilang tetap memiliki Gaya tersendiri walau sempat susah melepas Karakter Utama 2 Band bentukan Max Cavalera tersebut. dengan Background Kaum Gypsy, Zoltán "Zoli" Farkas yang lantang menyerukan pertentangannya dengan segala Tindakan Rasis yang banyak menjadi inspirasi penulisan lagu2nya. terbukti bisa menjadi sosok band cloning yang sukses, Ektomorf pun sukses menggaet banyak massa Fans Sepultura dan Soulfly yang mulai menyukai Gaya Neo Thrash Metal kepada karakter musik Ektomorf yang tetap padat elemen gaya Liar Soulfly awal dan era " roots "Nya Sepultura, ga heran Ektomorf pernah dipinang oleh label sebesar Nuclear Blast Records dan kini bernaung dibawah bendera AFM Records. setelah cukup sukses album akustiknya tahun 2010 lalu, band ini kembali menawarkan Konsep Neo Thrash Metal yang lebih ciamik di tahun 2012 dengan meluncurkan album " Black Flag " yang memang secara musikalitas tetap menawarkan gaya Sepultura dan Soulfly sekali dengan sound yang lebih megah dan Cool lagi. menawarkan pertama lagu " War Is My Way ", Ektomorf masih sedikit memulainya dengan akustik part yang Klassik Mistis banget gayanya yang kemudian memasuki menit pertama dengan gempuran Thrash Metal Style dengan sound yang Perfect untuk menggeber karakter Modern-nya. masih Liar berkoar, Zoltán "Zoli" Farkas tetap dengan gaya Growling parau in The Vein Max Cavalera-nya, Ektomorf tetap adalah Soulfly-nya Hungaria ! selain beberapa Growl Vokal, Zoli juga masih kerap menggunakan Clean Vokal pada beberapa Refrain track lagunya menjadi lebih terdengar Avant Garde, dan lagi2 Sound yang Keren menjadi sebuah kekuatan tak tergantikan dari sosok Ektomorf dibanyak album2nya yang sukses itu. " Unscarred ", lebih kerasa gw mendengarkan lagu2nya Slipknot banget di track ini, liat bagaimana pattern Vokal Zoli yang mengikuti beat drumming-nya secara enerjik lengkap dengan gaya Vokal " Berbisik "nya, yup kira2 seperti gw mendengar " Spit Me Out "nya Slipknot banget karakter Pattern Vokalnya. dan kembali " The Cross " lebih bergaya Neo Thrash metal banget ala Soulfly awal lagi. Sometimes, it's nice to know that there are bands out there that can still simply bulldoze through to the otherside for no other reason than they need to get there. walau sebenarnya ga ada yang terlalu Istimewa pada Materi terbaru kali ini, kita masih begitu merasakan kentalnya Karakter 2 band yang dibesarkan oleh Frontman Max Cavalera tersebut banyak menjadi attitude tak terhindarkan dari sosok band ini, gw dan fans band ini tentunya masih tetap mengagumi sound modern dan aransemen dasyat yang dimuntahkan oleh Zoli Cs ini. That feel remains for a lot of the album. The songs aren’t especially extreme in sound although lyrically they do seem to opt for something a little less tasteful. It’s not bad but isn’t particularly fresh or inspiring. The title track brings in a change of mood that is welcome but it only lasts for the mellow opening salvo. It quickly then dissolves into the samey background with everything else. The songs are just too simple to be pleasing and very little stands out to make comment worthwhile. Becoming More Popular since the band continued to receive sharp criticism as one of the band Sepultura Why Character Cloning Era "root" and Soulfly really diminish the spirit ga Thrash Metal band with a few touches Industrial and Tribal Ethnic origin Mezokovácsháza, Hungary that existed since 1993 by Frontman guitarist and vocalist Zoltán "Zoli" Farkas has The image Characters Max Cavalera really, anyway Ektomorf still arguably still has its own style even had difficulty removing 2 Main Characters Max Cavalera formed the band. with Background The Gypsy, Zoltán "Zoli" Farkas who loudly called for opposition to any racist act inspired many lagu2nya writing. 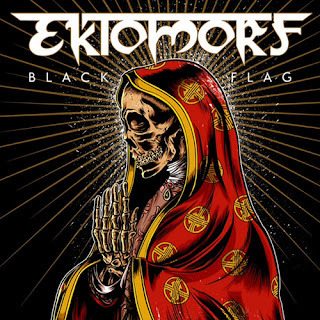 could prove to be a figure of cloning a successful band, Ektomorf was successful with a lot of Sepultura and Soulfly mass Fans are starting to like the style of the character Neo Thrash Metal Ektomorf music that stays solid elements of the style and era of the early Wild Soulfly "Roots" His Sepultura, Ektomorf ever wonder ga groom by the label of Nuclear Blast Records and is now shelter under the flag of AFM Records. after successful enough acoustic album in 2010, the band re-offer the concept of Neo Thrash Metal are more beautiful in the year 2012 with the launch of the album "Black Flag" which is a musical still offers style Sepultura and Soulfly once with a more majestic sound and Cool again. 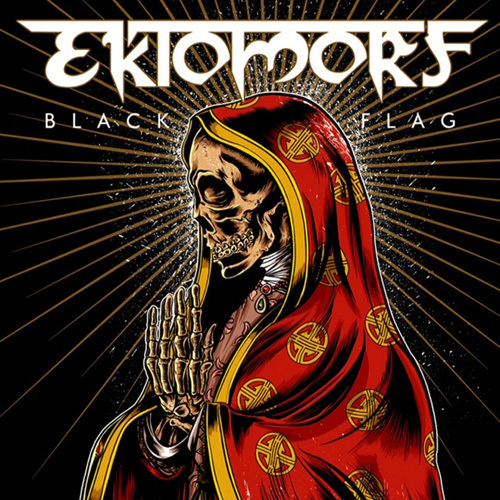 offers the first song "War Is My Way", Ektomorf still a bit to start with acoustic parts Klassik really mystical style which then enters the first minute to the onslaught of thrash metal style with sound Perfect for Modern menggeber his character. Wild still boasting, Zoltán "Zoli" Farkas Growling stick with raucous style in the vein of his Max Cavalera, Soulfly Ektomorf remains is his Hungarian! besides some Growl Vocals, Zoli also still often use Clean vocals on several tracks Refrain songs became more audible Avant Garde, and lagi2 Sound Cool to be an irreplaceable force in many parts of the figure Ektomorf album2nya a success. "Unscarred", more kerasa i listen to Slipknot lagu2nya really on this track, look at how the pattern Zoli vocals that follow the beat of his drumming is energetic style complete with Vocals "Whispering" her, yup kira2 as i heard "Spit Me Out" Slipknot its very Pattern vocal character. and return "The Cross" is more stylish Neo Thrash Metal Soulfly style really early again. Sometimes, it's nice to know that there are bands out there that can still simply bulldoze through to the otherside for no other reason than they need to get there. even though the ga was too Specials on new material this time, we still do not feel thickened character who was raised by two band frontman Max Cavalera is a lot to be inevitable attitude of the figure of the band, the band and the fans i certainly admire still sound modern and terrible arrangement that is spewed by Zoli Cs. That feel remains for a lot of the album. The songs are not especially extreme in sound although lyrically they do not seem to opt for something a little less tasteful. It's not bad but is not particularly fresh or inspiring. The title track brings in a change of mood that is welcome but it only lasts for the mellow opening salvo. Quickly It then dissolves into the background samey with everything else. The songs are just too simple to be pleasing and very little stands out to the make worthwhile comment.